Is Royal Caribbean Cruises Ltd. (NYSE:RCL) a good stock to buy right now? Investors who are in the know are becoming hopeful. The number of bullish hedge fund bets inched up by 10 in recent months. Our calculations also showed that RCL isn’t among the 30 most popular stocks among hedge funds. Let’s take a glance at the key hedge fund action surrounding Royal Caribbean Cruises Ltd. (NYSE:RCL). How are hedge funds trading Royal Caribbean Cruises Ltd. (NYSE:RCL)? At the end of the fourth quarter, a total of 52 of the hedge funds tracked by Insider Monkey were bullish on this stock, a change of 24% from the second quarter of 2018. 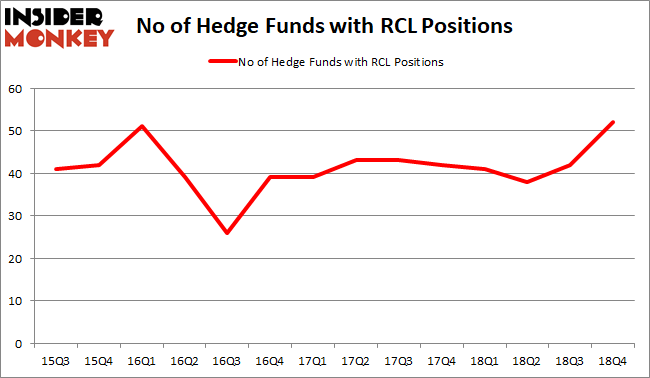 The graph below displays the number of hedge funds with bullish position in RCL over the last 14 quarters. With hedgies’ sentiment swirling, there exists a few noteworthy hedge fund managers who were boosting their holdings meaningfully (or already accumulated large positions). According to Insider Monkey’s hedge fund database, Ken Griffin’s Citadel Investment Group has the number one position in Royal Caribbean Cruises Ltd. (NYSE:RCL), worth close to $183.9 million, accounting for 0.1% of its total 13F portfolio. The second most bullish fund manager is Eminence Capital, managed by Ricky Sandler, which holds a $159.9 million position; the fund has 3.1% of its 13F portfolio invested in the stock. Remaining professional money managers that hold long positions include D. E. Shaw’s D E Shaw, Jacob Doft’s Highline Capital Management and Israel Englander’s Millennium Management. Now, key hedge funds have been driving this bullishness. Eminence Capital, managed by Ricky Sandler, established the largest position in Royal Caribbean Cruises Ltd. (NYSE:RCL). Eminence Capital had $159.9 million invested in the company at the end of the quarter. Gregg Moskowitz’s Interval Partners also initiated a $47.9 million position during the quarter. The following funds were also among the new RCL investors: Aaron Cowen’s Suvretta Capital Management, Doug Gordon, Jon Hilsabeck and Don Jabro’s Shellback Capital, and Mark Kingdon’s Kingdon Capital. Let’s go over hedge fund activity in other stocks similar to Royal Caribbean Cruises Ltd. (NYSE:RCL). These stocks are Spotify Technology S.A. (NYSE:SPOT), PPL Corporation (NYSE:PPL), Telefonica Brasil SA (NYSE:VIV), and M&T Bank Corporation (NYSE:MTB). This group of stocks’ market valuations are similar to RCL’s market valuation. As you can see these stocks had an average of 30.5 hedge funds with bullish positions and the average amount invested in these stocks was $1331 million. That figure was $1579 million in RCL’s case. Spotify Technology S.A. (NYSE:SPOT) is the most popular stock in this table. On the other hand Telefonica Brasil SA (NYSE:VIV) is the least popular one with only 12 bullish hedge fund positions. Compared to these stocks Royal Caribbean Cruises Ltd. (NYSE:RCL) is more popular among hedge funds. Considering that hedge funds are fond of this stock in relation to its market cap peers, it may be a good idea to analyze it in detail and potentially include it in your portfolio.